The conflict in the Central African Republic (CAR) is the world's most neglected displacement crisis, according to the Norwegian Refugee Council. Unveiling its annual index, the aid agency said on Thursday that the world pays the least attention to humanitarian crises when they force Africans from their homes, dashing hopes of peace and raising the risk of escalated conflict. In the NRC's list of the world's 10 most neglected displacement crises, CAR was followed by the Democratic Republic of Congo (DRC), Sudan, South Sudan, Nigeria, Yemen, Palestine, Ukraine, Myanmar and Somalia. "The fact that most of these people do not turn up at our doorsteps gives us no right to close our eyes to their suffering, and does not remove our responsibility to assist," Jan Egeland, the NRC's secretary general, said in a statement. The NRC analysed all countries worldwide in which more than 100,000 people are displaced. The countries topping the list are characterised by insufficient economic support to meet the most basic humanitarian needs, limited media attention and lack of political will to solve the crises. "The international community has not only forgotten these crises, but has never really shown sufficient willingness to contribute to a solution," Egeland said. "Economic support to alleviate humanitarian crises must be given based on needs, and not be subject to geopolitical interests." Chronic conflict involving militias in countries such as CAR and the DRC could drive more and more people into armed groups, said Richard Skretteberg, a senior NRC adviser. In 2016, the United Nations only received 38 per cent of the money it needed to distribute humanitarian aid in CAR. Almost half of the population faces food insecurity, eating only one meal per day, according to the NRC report, while only 35 per cent of people in CAR have access to clean water. "When you combine limited state presence in much of these countries, mass displacement, and a lack of protection and aid for civilians, this creates a fertile breeding ground for radicalisation," Skretteberg told the Thomson Reuters Foundation. "Rebuilding and working towards peace are difficult when so many people are displaced," he added. One in five Central Africans - about one million people - is displaced, and at least 100,000 were newly uprooted last month in some of the worst violence between the mainly Muslim Seleka rebels and Christian militias since conflict began in 2013. 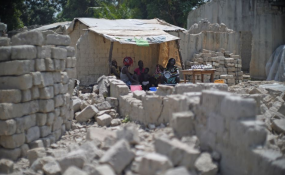 Spreading ethnic violence in the DRC has also forced more than 1.5 million people to flee their homes within the country this year - more than triple the number uprooted within Syria and five times the number within Iraq, according to the NRC. The UN has received just one-fifth of the $812.5m sought in the humanitarian appeal for DRC this year, and 25 percent of the $400m requested for Central African Republic, the UN's Financial Tracking Service shows. Africa's arid Sahel belt, which stretches from Senegal to Eritrea and lies south of the Sahara desert, topped the NRC's index last year, followed by Yemen and Libya.